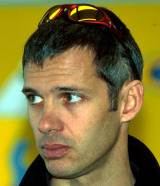 Paul Belmondo is the son of French actor Jean-Paul Belmondo and raced in a number of grand prix in the mid-1990s. He paid for drives at March and Pacific but both teams struggled to qualify and he only started seven grand prix. He had failed to distinguish himself in junior formulas and as soon as his funding ran out he was left without a drive in Formula One. Thereafter he concentrated on GT racing, at the wheel of a Chrysler Viper GTS-R. He started his own team, Paul Belmondo Racing, which raced in the FIA GT Championship and Le Mans Endurance Series championship before folding in 2007. The son of actor Jean-Paul Belmondo and grandson of sculptor Paul Belmondo, he gained more publicity for becoming the lover of Princess Stéphanie of Monaco than for his racing.